One third of the energy you'll use today will be used at home...your TV, your lights, the refrigerator, maybe the computer you're using to read this blog. 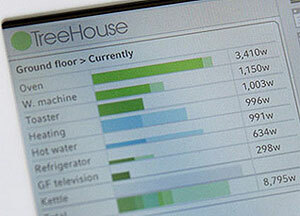 You want to reduce your energy use at home, but how to begin? Just yelling "turn out the lights!!!" isn't going to cut it. There's a whole new generation of power meters coming to market that give you more details about your electricity use than you ever thought possible (for instance, check out the one from More Associates). The BBC has a fine article about the meter revolution.